The site offers one of a kind and limited edition artworks “to suit all pocketbooks” as the saying goes. The pieces are made to order and range from photos to bracelets, oils to the beautiful “Gentlemen’s Semainaire”, a valet designed to organize the various sundries of modern life. 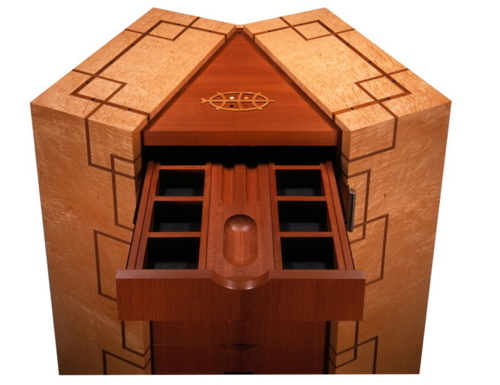 It was designed by a Canadian of Dutch ancestry, John Wiggers, and is made of Curly Bird’s Eye Maple, Ebony and leather among other fine materials. And yes, he’s a green artist. Now, I don’t have the USD$15,000 asking price (chim, chiminey, chim, chiminey, chim chim ch-rooo…), but it is one of a kind and it would inspire just about anyone to be neater, wouldn’t it? I could begin to acquire a few pieces to fill my made-to-order semainaire… say these “soundpieces” by Danielle Crampsie. Just the thing for the music loving clotheshorse. I wonder if she takes requests? This entry was posted in Elegantology, Living and tagged Elegantology, Living, resources. Bookmark the permalink.